We celebrated our ‘Staff Day’ on 4th September 2015 with a difference. In the morning session the students took the role of the teachers and and conducted classes both in School as well as in College. 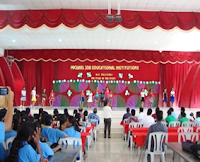 In the afternoon at around 1:45 all the staff members gathered at the MJMHSS and proceeded to the Auditorium accompanied by with band music. At the auditorium they were welcomed with a rose and card prepared by the students. Cultural programmes started at 2:30 with a prayer song by Sabina choir. Ms. Joan of Class XII welcomed the gathering. 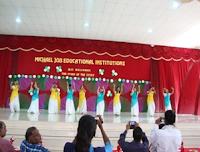 There were four dance performances by school students and college girls. Ms. Roja Jasmine, Staff of MJC and Dr. D.Devaneesan Sanjeevi, Principal of Michael Job College of Education spoke to the gathering. A PowerPoint presentation on all the MJC Staff members was made by the MJC students and it was the highlight of the Staff day programme . All of us had tea and snacks together. All the staff members were presented with mementos. 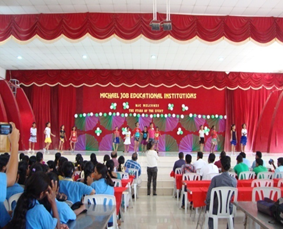 Vote of thanks was given by Dr. D.Devaneesan Sanjeevi, Principal of Michael Job College of Education. The programme ended with National Anthem. Ms.Magdalene, I Mcom (IT) was the Master of ceremony.